As a millennial, I consider myself worldly wise when it comes to Internet scams. I never buy anything on eBay that ships from China, I double check any Amazon marketplace purchases I make and Google the heck out of reviews before purchasing any tech refurbs. I was about to head for the hills but then I saw this: “If you you’re not ready to make a purchase, simply Skip The Month by the 5th and you will not be charged. Skip as many months as you’d like.” That sounded pretty good. It definitely seemed like it was a new business model. I figured it was a source for cheap shoes, probably a bit above Payless. But I was broke and really wanted a new pair of boots, so what’s the harm? I found some cute boots with great reviews for both comfort and quality. The site told me that 96% of the community recommended them! Thus assured, I placed my initial order and waited for them to arrive. They arrived packed in a cute pink and black box and nestled in hot pink tissue paper. From first glance they looked a bit cheap. The color was not what I expected, but, hey, it’s only $19.95! Then I slipped them on. OMG. Cardboard is more comfortable. The boots were simultaneously too big and too small. They actually hurt just to wear around in the apartment. Oh well, I thought. Back they go. Thus, I began my journey down the black hole that is JustFab.com. All promotional purchases are final sale. This includes the initial $19.95 pair. I began to look through the site and I realized that a lot of the merchandise is actually coded as promotional. Not even eligible for site credit, just final sale. How did I miss this? Well, simply because it wasn’t on my radar. It’s so out of the ordinary to not allow returns. I guess I also figured that there would be more disgruntled members under such a policy, but they all seemed so happy. So, being pissed off at this point, I wrote an angry review under the boots. But guess what? It was never posted to the site. I’m no stranger to companies gaming the system. Restaurants do it on Yelp all the time, but censuring out all negative comments was another unforeseen event. I tried to cancel my membership. Despite having a link on the site that says “cancel membership,” JustFab then directs you to call them. So I did. After being on hold for 30 minutes, I hung up. I had other things to do and figured I just wouldn’t buy anything else and they wouldn’t charge me. Unfortunately, I neglected to go to my account between the first and fifth of the month to click “skip this month,” so I was charged and received another credit. 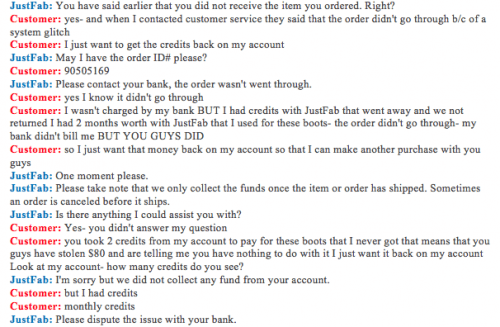 So far, JustFab was not technically a scam. Shady, yes, but not a scam. But then it got worse. Much worse. Fast forward to mid-December. I have two credits for JustFab and still need new boots. For the holidays they introduced a “Luxe” line of shoes made with real leather, which promised to be a bit better. I have already sunk money into this stupid site, so I figured I might as well buy something that seemed to be better quality. Since it was their “Luxe” line, it was 2 credits plus $20 of my own. My employment situation had changed since I signed up for JabFab, I told myself that if I could find new boots for $20 I’d snag them. So I figured this could work. I made the purchase. It included free rush shipping just in time for Christmas. I never received a confirmation email so the next day I figured I’d use their live chat function to contact them to make sure the order went through. The live chat representative informed me that their site had been down and that my order hadn’t actually gone through. Fine, I thought, I’ll just keep my credits and forego the boots altogether. On January 2nd, I logged on to my account and carefully clicked the “skip this month” button to make sure I didn’t get charged again. Then, I noticed that the site said I had 0 credits. That must be a mistake, I thought. The order didn’t go through, so clearly the 2 credits ($80) I used should have been refunded. This continued for quite awhile until finally they just hung up on me (seriously). I did indeed manage to get one credit back into my bank account. I considered this to be a significant victory, but the other $39.95 was not to be found. I reported all of this in their customer service questionnaire after the chat. I have yet to receive any response (not that I was expecting one at this point). I’m writing this not merely out of anger or revenge, but also as a warning. I Googled JustFab.com and there’s surprisingly little out there about them. I think many of us feel really sheepish at being taken advantage of in this way and just pretend it didn’t happen. The truth is plain, however. This is a predatory site. They will take every possible chance to rip you off, whether through procedural fine print (the skip a month process) or through blatant misconduct. Update: Thanks for all of your support and RTs! I was able to get through to JustFab today and successfully cancel my account. Here are a few tips: they will always say that there’s going to be a long wait so don’t be dissuaded by that. Be very clear that you want to cancel your membership once you get on the line with a customer service rep. I had to repeat “No. I just want to cancel my membership” about 10 times. Make sure you get a confirmation number for your cancelation. They say that they will send you an email within 24 hours but we’ve had reports that on occasion they fail to do so and then dispute that you ever cancelled your account. Similarly we’ve heard that occasionally they will still “accidentally” bill you so I’ll definitely be keeping an eye on my bank account. Here’s the rub, of course. I lost that last credit. So that’s $39.95 down the tube. But I think I’ve gotten off easy. I’d advise all of you—just do it and don’t look back. Keep bugging them until they want to get rid of you because you’re more trouble as bad press than you’re worth! Tweet them at @JustFabOnline and use the hash #JustFab to share your experiences and demand action. They will just give you platitude auto-reponses but your tweets will show up under their username for others to see and that’s the side of their company that they’d rather not show. Have you been scammed through JustFab.com or another website? Tweet us @LitDarling.